Rico's a diggin fer gold. green gold, that is. XD. Wallpaper and background images in the 마다가스카의 펭귄 club tagged: penguin penguins of madagascar rico. "Oh, that image will haunt me." Unless that "green gold" is an emerald, I tend to think it's not going to be worth too much. *Runs out the door screaming* Spi, save me!!! I'm going to croak of utter disgust!!!! 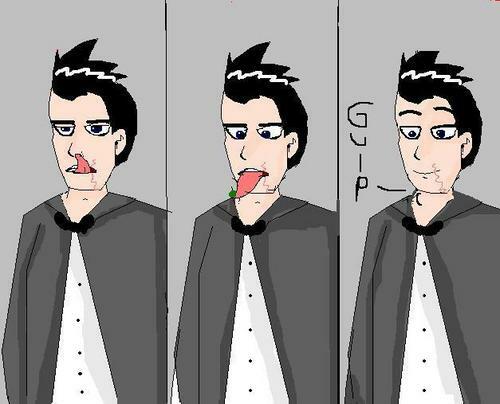 Basically, when I saw his long tounge, I had a few childhood memory flashboacks, adn this happened. ^^ My Bff in kindergarten would do this all the time. she ahd an unvleievable long toung. We would all stare as she did it, horrified, yet, unable to look away. EW! That's disgusting. If it was penguin, it probably wouldn't be so bad, but human-ized? Did you really have to do it human-ized?